Trainer Difficulty is set at 50% by default, which is why Zwift says it “treats the gradient as half of the true grade.” So when you hit a 10% grade in Zwift, it feels like a 5% grade in the real world. 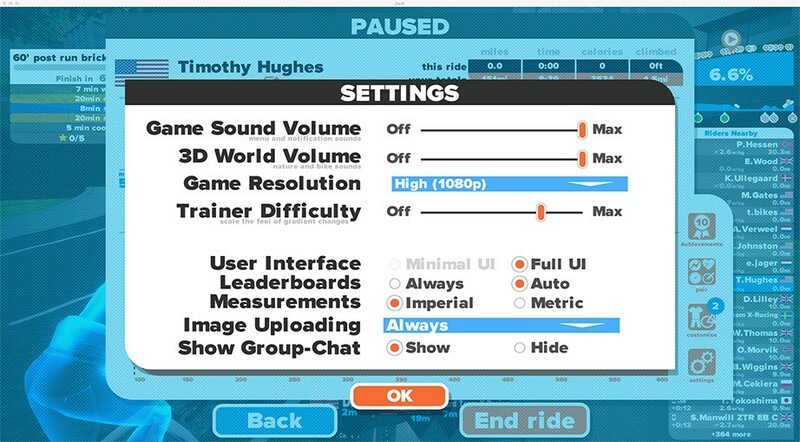 Why does Zwift default to 50% and not 100%? I’m not completely sure, but my guess is it has a lot to do with lower-end smart trainers only supporting maximum grades of ~7%. What Does “Trainer Difficulty” Change? 100% difficulty: not recommended unless you’ve got a high-end trainer, a penchant for shifting often, and a need to punish yourself! Lowering your Trainer Difficulty decreases resistance changes on hills. You still have to put in the same amount of power to get up (and down) the hill, but you will “feel” the hill less. Another way to look at it: the Trainer Difficulty setting determines how much shifting you will need to do. Where you might typically use 7 of your gears when riding at the default 50% setting, lowering it to 25% would let you ride and only use ~3 gears, since the uphills and downhills will feel less steep. It is important to understand that lowering or raising Trainer Difficulty does not change the power needed to get up the hill. You still have to put out the same cumulative watts to move the same distance as before… you’ll just be doing it in a different gear. Set to 0%. You won’t feel any terrain changes on this setting. One common complaint from smart trainer owners is that they get dropped by other riders on downhills. The challenge is that smart trainer riders (whose resistance is constantly changing to match terrain) are competing against dumb trainer riders (whose resistance is constant). A smart trainer attempts to mimic the feel of real-world riding, where it is difficult to maintain high power levels on downhills. For a dumb trainer rider, the downhill feels just like the uphill and the flats, so they can put out a lot of power on those downhills while the smart trainer riders spin out. On uphills the opposite happens–smart trainer riders often pass dumb trainer riders, because the dumb trainer riders must shift to a harder gear to generate the increased power needed to keep up with the smart trainer riders. Most dumb trainer riders figure this out pretty quickly, though, and learn to shift as needed. Smart trainer riders get a bit of a raw deal here, because they have no choice but to spin out in their hardest gear on fast downhills, while dumb trainer riders can fix their uphill challenges by shifting properly. But this is a necessary evil if Zwift wants to have lots of riders embracing the platform. What’s the solution for smart trainer riders? Lower the difficulty slider to 25-40%. This will make hills seem less steep, and allow you to put more power into the downhills. Give it a try and mess around with the setting until it feels good to you. For more on this topic, read Hanging with the Group Over Gradient Changes. Should I Change My Trainer Difficulty Setting? No need to change the setting if you are happy with the “feel” of your rides in Zwift and you aren’t struggling with yo-yoing in and out of the pack on group rides. If you think you’d like to adjust it, though, go ahead and give it a try–you can always set it back to 50%. Very helpful comments in this thread. I am having similar issues that I find really confusing. I ride a compact 50-34 chainring and a 11-27 cassette. I have a 2017 Kickr Snap and I perform a standard spindown using the Wahoo Fitness app for iOS before every ride. (I don’t have the advanced calibration option as the new firmware apparently addresses the issue.) My Snap is paired only to an iPad via the app. I have set the Trainer Difficulty to about 35%. When climbing a 10% incline in Zwift, I find myself in a 50-17 gear, spinning at a cadence of about 90rpm, putting out around 170 Watts, and traveling at 3mph. This is very different from a real road ride, where I wouldn’t possibly run that gear, cadence and speed combination. I may be going 3mph and spinning at 90rpm, but I’ll be in a 34-27 gear. Despite all the good insights in this thread, I still don’t understand what’s happening here. Is my trainer in need of some form of advanced calibration, do I need to adjust my trainer difficulty, or am I experiencing normal behavior? Thanks a lot for your help and advice! Anyway — found how to do an advanced spindown on the newer Snap model (not obvious in the current iOS app) and saw a small change to my brake loading value. More importantly, I adjusted Zwift’s Trainer Difficulty setting from about 35% to about 70% and this made a huge difference. I’m now using my entire gear set on certain climbs. Much more realistic…and painful, but in a good way. I have a Kickr2016. I find that when doing the Beginner 6 week FTP program, and setting the trainer in ERG mode that sometimes Zwift will ask for a wattage, say 90, and the trainer will respond with 90, and not allow me to change much, adjusting cadence as expected. Other times Zwift will ask for a wattage, say 100, and the trainer will respond with 98. No matter my cadence, I am locked to the 98. The response is always 2-3 watts less than the requested if there is an offset. I found that if I hit page-up a couple of times, the response will increase, so that Zwift is asking for 100 and the trainer is responding with 100. Is this normal? I would think Zwift would tell the trainer 100, and the trainer would set a level of 100. What am I missing here? Perfect….I’m getting surgery on my right shoulder on Monday and I’m hoping to be able to ride long before I’m able to shift so I’m seeing a temporary zero setting for my Kickr Snap in my immediate future. I’ve long wondered about the training effect simulating hill grades on different muscle groups… but haven’t found much info on it after a quick google. My hypothesis: instantaneous (unaveraged) pedal velocity and force is not equal when pushing 350 Watts up a 10% grade at 70 rpm versus pushing 350W on the flat with the same cadence. This might be because you have more inertia on the flat so you lose a lower proportion of your momentum around the stroke through the “dead spot” … whereas climbing you lose a greater proportion of your momentum during you weaker part of the stroke… which could lead to a different, more varied, force and velocity profile around the stroke compared to the situation on the flat…. However, not a sports scientist so not sure what this means in terms of specific training effects… but if you are training for large climbs, maybe better to have the difficulty up and raise the front end of the bike to change how you support your weight? Any opinions? My thought is that everyone has an optimal pedal force/cadence combination when you are forced to switch gears you are not at an optimal combination all the time since you don’t have an infinite number of gears. The result is you have to work harder for the same result. For me, riding the same course on zwift at 0 percent difficulty vs.a ride at the standard 50% resulted in a lower average watts but a shorter elapsed time. As a result I can’t ride the big climbs in Watopia as it would take me hours to complete them and I can’t race as I get dropped instantly. To overcome this I have found dropping the trainer difficulty to around 20% results in what I consider to be a realistic power output and speed. It goes up when I push hard and down when I ease off, as you would expect, and does so no matter the gradient. But I feel like I’m cheating as I have the trainer difficulty turned down low. Any ideas how to overcome this? I’m currently investigating why I get momentary power drops with my kickr snap. I’ve noticed a lot of times that this happens when there’s an elevation change… I’ve also seen 7 percent figuring prominently in this. It even happens when I’ve set the trainer difficulty to zero so shifting isn’t factoring in. I’ve got a new ant+sensor coming in case it’s that (I locate the sensor about 10 inches from the trainer) but I don’t think that this is the issue since my cadence (Garmin) and heart rate (Garmin) aren’t dropping ever. That’s wierd, I have 5he opposite with my tacx vortex. At 50% my watts are lower going up to the tower but 100% difficulty and my watts are higher. If I did 20% it would take me forever. Is this just equivalent to changing the rear cassette ? ie if you have a 28 and want to make it feel like a 32 you can just tweak the trainer difficulty ? I use it that way. I have 53/39 12/25 and I have set it to 60%. That allow me to use the whole range of gears as in relation life. That is more important than being fast in Zwift for me. actually, it is more like changing the radius of your wheel since both your high and low gears have lower development. This physics in this article is seriously wrong. Changing this setting is no different than changing your gearing set up, hill feel easier but you don’t go as fast. just encounter a strange thing. My Taxc utility program shows a output of 300W and at the same time Zwift shows 250 W, and at Taxc 140 W, Zwift shows 160 W. Bushido Smart freshly calibrated. Whats going on ? Best explanation that I have read. Thanks. I have a 34 front/25 rear on my Wahoo Kickr set up but when I ride the climbs in Europe I have a 36/32 on my road bike IRL. I am happy to get the higher cadence on Alpe du Zwift that a 50% Trainer Difficultly setting provides without needing a long arm derailleur and cogs on the back. So… what trainer difficulty % do I set to mimic the real world? I run a compact chainset with an 11/28 cassette and if I want the trainer to match the real work of that setup, so that for example, if I were to tackle Alpe d’Huez in real life, it wouldn’t be massively different. Anyone know what gearing 100% Trainer Difficulty is set to mimic? Set it to 100% to mimic the real world. Trainer Difficulty isn’t set to mimic any gearing–it’s just set to mimic how much you feel the gradient changes. 100% means you’ll feel a 10% gradient as 10%. 50% means you’ll feel a 10% gradient as 5%. It’s still there. If you aren’t seeing it that means you don’t have a controllable trainer paired.